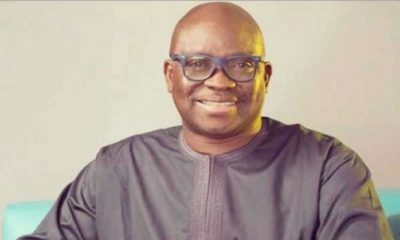 Ekiti State Governor Ayo Fayose has said he was not one of the governors who approved the withdrawal of $1 billion from the excess crude oil account to fight Boko Haram. 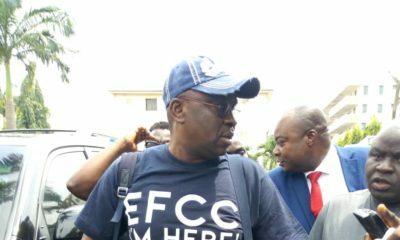 Godwin Obaseki, the Edo State governor, had on Thursday announced to newsmen that governors from all 36 states had approved the withdrawal of the sum. Obaseki said the announcement of the approval was made during the NEC meeting by the chairman of Nigeria Governors’ Forum (NGF), Abdulaziz Yari, the Zamfara State Governor. 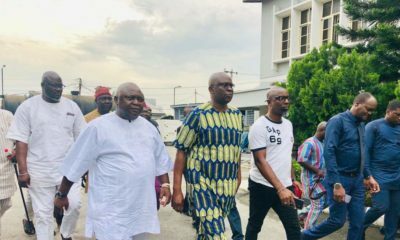 Fayose, on is Twitter, said he isn’t a party to the decision. 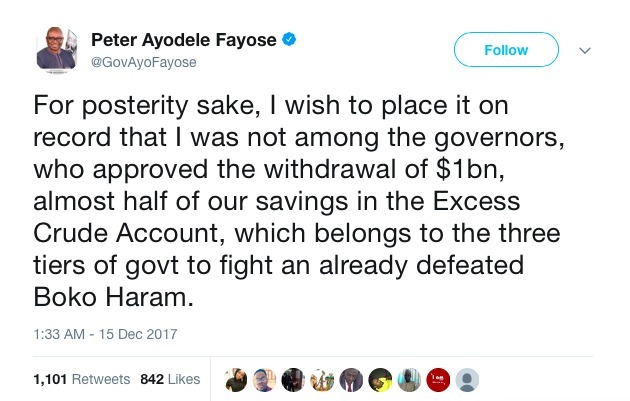 For posterity sake, I wish to place it on record that I was not among the governors who approved the withdrawal of $1bn, almost half of our savings in the Excess Crude Account, which belongs to the three tiers of govt to fight an already defeated Boko Haram. Since they said they have defeated Boko Haram, what else do they need a whopping sum of $1 billion (over N360 billion) for; if not to fund President Buhari’s re-election in 2019? The APC promised to wipe out Boko Haram within six months, now it is 31 months and what the APC government is wiping out is the economy of Nigeria and the means of livelihood of the people. They told Nigerians that the decision to withdraw $1bn from the Excess Crude Account was taken by governors of the 36 States, whereas, it was solely the idea of the federal government, which they used the arranged National Executive Council meeting to achieve. The question is; how can the federal government alone spend almost half of the Excess Crude money that belongs to the three tiers of government (i.e. Federal Government, States and Local Councils)? The reality is that our treasury is daily being looted in readiness for the 2019 elections. Nigerians are therefore alerted to this lootings by the APC led FG to amass huge fund for the 2019 elections under the pretense of fighting Boko Haram as well as other dubious means. N360bn is equivalent to what the Federation Account Allocation Committee share to the FG, 36 States and 774 LGs monthly. Nigerians deserve proper explanations from the FG on the rationale behind spending such huge sum of money to fight an already defeated Boko Haram. Buhari is a bare faced thief. The type that comes to your yard and takes your chicken in your very before and you are too chicken to say anything. Nigerians under a spell or is it fear?